best grow guide yet....THE MARIJUANA GROWER'S GUIDE... by Mel Frank and Ed Rosenthal I strongly suggest you buy the book....i did !!!! 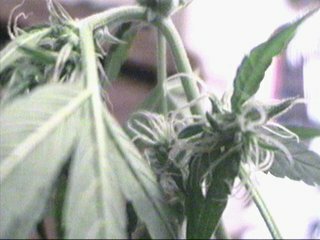 and now i call it "my Grower's bible"
Here's some info to read. 24- The BEST seeds possble to obtain! 1- copy of this phile! 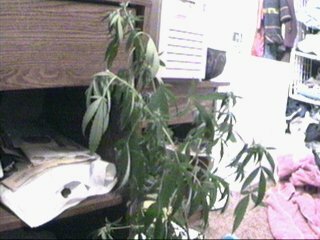 Why would anyone want to grow pot in their closet? but rather ROOMS full of 100 dollar bills.The Big Boys. that I have never sold so much as one Gram of my pot. of Fate and coincidence to your getting busted.Kharma's like that. and put them on a scrap of UNPATTERNED paper towel in th Petrie dish. and place the dish in indirect light, still keeping the babies warm. that the temperature doesn't shock the seeds. about 1 to 1-1/2 inches, it is time to prepare the Jiffy-7 pots. until they are fully epanded. Poke down 3/4in. with the point of the tail pointed down. Leave the husk part of the seed just barely exposed. in a shallow pan of 1/2 strength nutrient mix, keep warm and moist. and established well enough to suvive being put under the lights. But we haven't got our grow-closet set up yet do we? was 2-1/2 ft. deep by 6 long and 8 ft. high. and that may confuse yourplants. and run them out of the loset and to the ballast. and do the same thing on the back wall. Cut shelve corresponding to the depth of the closet. you will have a plant shelf upon which to put your plants. I place one long plant board in. from the back wall and 24in. under the light. the rear level is closest to the light. which doesn't adress the height-variation problem anyway. of vibration absorbing material such as 1/2in. foamrubber. you can leave a 3in.gap between its edge and the left wall. that the ends rest on the bottom of the pan. possible. The fan wires go to the timer so it is always on when the light is. so as to mount a shelf for 1-5 gal plastic restaurat bucket. Cut the tubing into 3 pieces: 2@ 3 ft. and 1 at 10 ft.
on each side of your lamp and reflector asembly. with the long leg reacing the floor level. plug the fan and balast a.c. input and ground. because the tremndous amount of heat produced by the device. a fire hazard at worst.O.K.? Then we shall procede! will tip off the electric co and then they'll probably pick that up to you-know-wh. better but in a closet the lumen yield amounts to overkill. when you get into mass resin productin. But more about that later. so let's move righ along onto the next part. THE PROPER DIET IS EVERYTHING,(almost). apmospheric composiion,pH balance and pest control! in th right proportions, the result can be mouthwatering! of 1000 to 1200 ppm of disolved salts. where you purchased your supplys they should be glad to give you a reading. or you're back to farming rope again. balance the pH with Potassium Hydroxide to 6.4 to 6.6. Do not allow your solution t wander out of this range. .Just ake sure the water you start with is in range. unless you notice that the soil is still damp from the previous day. poisons will build in your soil and kill you plants. A good medium is made from 3/4 potting soil and 1/4 sand. Add a handful uf vermiculite (unued catlitter) per gal. of soil mix. so beware of doing things you might consider doing to a houseplant. Death by transplant shock is a function of ignorance. and you will lose not one plant! on the bottom of a pot with a drainage hoe in it. Put 2-3 in of soil on the rocks. CAREFULLY remove net from Jiffy 7 unless root is poking though. If that is the case just loosen the net as much as possible without disturbing the root. and it makes watering damage non-existant. Put the plant on the shelf that is 24-36 inchs from top of plant to bottom of bulb. When top reaches 24inches or starts 'brown curling', it's tim to move it to the next level. 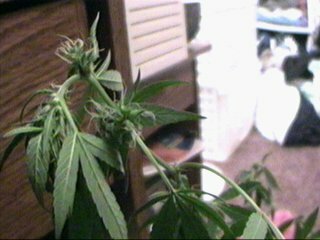 The first month, I try to pinch the main stem onceto produce two main stems. traveling around the plant in corkscrew fashion.Shade leafs are a big targetfor me also. Look down on the plant for a bulbs-eye view of what constitutes a shade leaf. Don't getcarried away. Get any yellowing or wimpy inside losers. You'll know them when you see them. designate a 'smoker" and trim thehell outa that one if you must. so don't dally when it come to killing off the males! Us and King Herod, eh? just pamper your girls and don't even pull off the yellow leaves. and to a large degree, how well you've done YOUR ob, they should just about be ready to bud. to the spectrum jut as the sun does as it plays lower on the horizon. As well, the nutrient must undergo a little tweking. You should go to a 7-19-14 mixture and reduce the micro nutrients by 25%. The amount of the daly feedings will drop dramaticly and you must guard against overwatering. Do not stress the plants b witholding water however or maledom may rear its ugly head. When buds set, kill males. Only removethoroughly yellowed leaves. cut ff humidity system and increase photoperiod gradually to no more that 15 hrs. If you have been utiliing cO2 richment, cease that also. Stress plants by under watering. Some people take sissors and slie up leaves to bleed them. and all sorts of thigs stimulate production. Mostly things to do with heat and injury. This is how Icure my produce. and encase the ball in a baggie, sealed around the stem with a twist-tie. but there are as many methods of drying pot as there are of growing it. Freezing pot will presere it the longest. Just take normal freezer precautions and it'll maintain its THC forever. Not so ina drawer someplace. and I say i's time for another Bonghit! 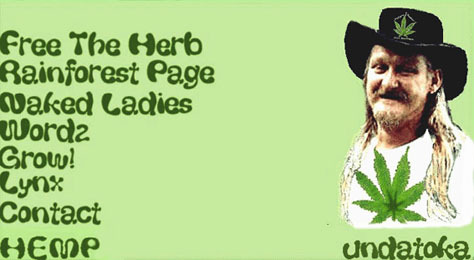 This page last updated on the 12th Stoned day of Oct .